Brands earn $38 for every $1 they invest in email marketing programs, according to Email Marketing ROI: The Factors That Lead to Better Returns, a research report published by Litmus. In other words, brands generate a 3,800% ROI on email marketing. Yet, emfluence’s Email Marketing 2018 Benchmarks Report shares that organizations are slow to adopt email marketing automation – only 2% of emails sent by B2B organizations and 3% for B2C organizations are automated. Jessica Best references these statistics in her Content Marketing World presentation, Email Marketing Automation at Every Level. Despite repeated proclamations about the demise of email, it continues to serve as the foundation for customer acquisition, communications, and support. Consider online ordering for an e-commerce brand as Jessica shares in the graphic below. Email is the center – to communicate the purchase confirmation and shipping status, and subsequently to solicit product feedback, promote related products, or provide special offers and coupons. As you’ll see in later examples, the email platform leverages this data to provide personalized messages and implement business logic related to email sequences (i.e., determining the next email to send and when to send it). All brands have a wealth of data. The more connected that data is to their email platform, the closer they get to the 3,800% ROI of email marketing. Strong ROI in email marketing is based on the notion that the people on your email list want to hear from you. If you purchased a list from a broker, the recipients likely don’t want to hear from you. They’re more inclined to block your emails or report them as spam. In a nod to Seth Godin, Jessica urges you to practice “permission marketing” when building your email lists. “Ask people’s permission to market to them and then when you talk to them, they’ll be listening for what you have to say,” she says. Give them the value you promised at the time you asked for their email, learn what they need, and when they might need it again. For example, if the recipients entered the CRM system because they submitted trouble tickets, they haven’t given you permission to send them marketing emails nor are they likely to welcome marketing emails. 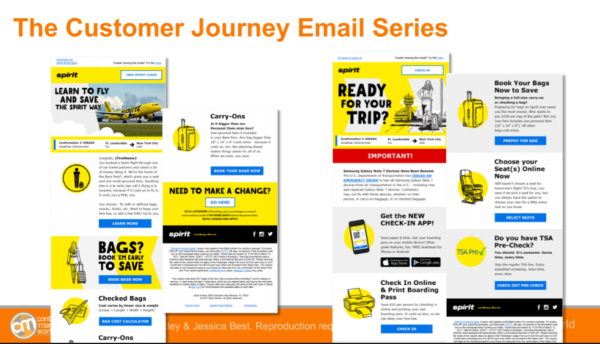 Jessica shares three recipe types – beginner, intermediate, and advanced – that can work for marketers with varying email marketing experience. Only 40% of marketers employ welcome emails, Jessica says. That’s a lost opportunity for the missing 60%. “Your welcome email is likely to be the highest open rate you get on any email you send unless you send a birthday email,” Jessica says. “This coupon generates more revenue than even their abandoned cart email,” according to Jessica. The lesson? Aim high with your welcome emails. You may think they only serve a logistical need (e.g., acknowledging the subscription), but they can do more. 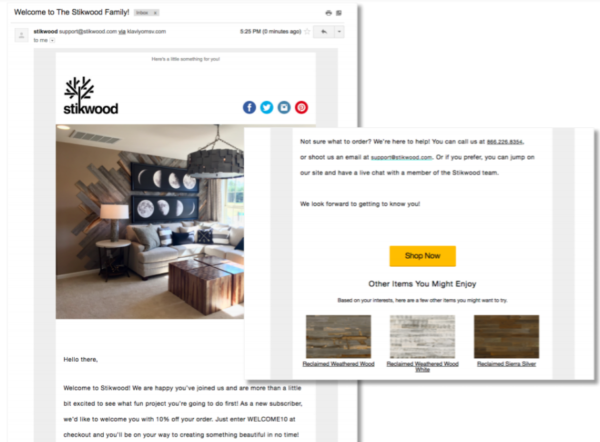 In B2C, as with Stikwood, it drives sales. In a B2B brand, the welcome email can move subscribers down the sales funnel by offering related content or a free product trial. Based in Kansas City, Mo., Indigo Wild sells natural bath and body products. It found that people who purchase a second time are far more likely to become life-long customers. Customers are invited to take a quick survey and are enticed to do it with the offer of a free sampler pack with their next purchase (i.e., the all-important second purchase). 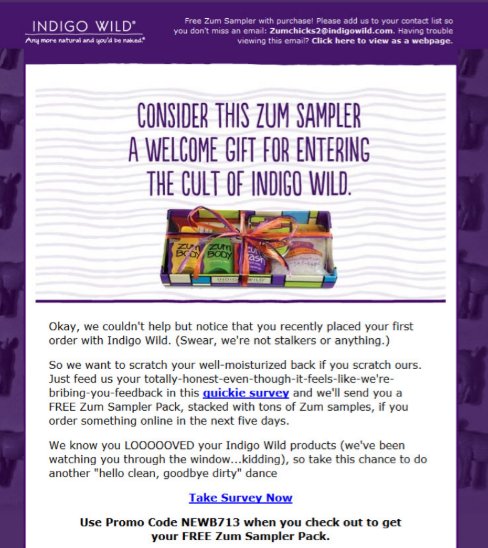 Indigo Wild found the survey takers are 40% more likely to use the promo code in the email even though it’s available to all recipients. Why? Because after spending time to take the survey, they’re more committed and eager to be rewarded. A representative of Armed Forces Bank, a client of Jessica’s, wanted to do an experiment, turning a single customer onboarding email into a series of six emails. The executive team resisted, so she did a test, holding out 10% of the list. Though the third email with the call to action to open a savings account had an abysmal open rate, the bank noticed something surprising: The group receiving it in the series of six onboarding emails had a 40% lift in new savings accounts compared to the group who only received a single onboarding email (with no savings account messaging). The bank also noticed that after the customers received the six onboarding emails, account balances went up and more accounts stayed open. The lesson? Extending the messaging and building a relationship with subscribers can drive stronger business results compared to a single email. Spirit Airlines is an ultra-low-cost carrier in the United States. It unbundles fares to offer the lesser-priced tickets. Customers pay for a ticket and then pay for additional services – printing a boarding pass at the airport, having carry-on baggage, selecting a seat, etc. The emails detail the many à la carte services and provide clear calls to action (e.g., “Book Your Bags Now to Save” and “Choose your Seat[s] Online Now”). As noted earlier, email platforms need to talk to the many data systems in the business in order to make this happen. In the case of Spirit, those data systems include a CRM and a reservation system. 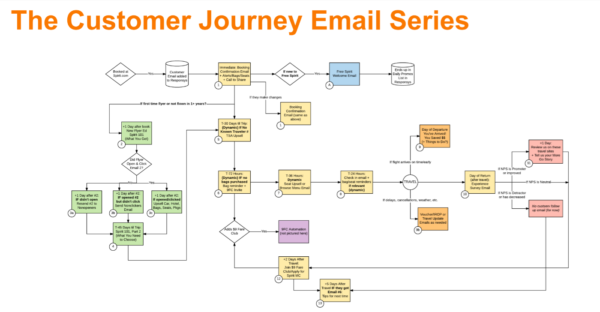 The email journey includes paths for new Spirit customers and differentiates between travelers with TSA Pre-Check and known traveler numbers. The emails are scheduled relative to the date of the customer’s upcoming flight. Jessica says the educational series has helped Spirit Airlines make gains in its Net Promoter Score, which measures how likely customers are to recommend a brand to others. “We’ve set the expectation of how to take advantage of Spirit’s excellent low prices, while still not feeling shorted,” she explains. The lesson? By combining data from your brand’s business systems, email marketing automation can be used to keep customers informed and happy, turning them from potential detractors to active promoters. The first email (on the left) says, “Hi, Sarah. Welcome home.” The image is a home in the community where Sarah was house shopping. The second email is sent about a week later and is based on what Sarah clicked on in the first email. This is all orchestrated via Meritage Home’s marketing automation platform. A healthy content marketing program is essential to this welcome series, as the tailored content needs to keep subscribers interested and engaged. Follow-up emails feature content about pests, cleaning, home financing, and utility bills. The lesson? Clicks in emails provide hints about the content the recipient wants to receive, allowing marketers to ensure that the content they create – and that can be triggered in the marketing automation software – keeps subscribers engaged. ARAG is a legal services provider based in Des Moines, Iowa. ARAG targets – among other groups – women planning their weddings, with an offer of free advice in exchange for an email opt-in and a bit of information about their plans. ARAG first sends two to three content pieces that the women can use right away. Subsequent emails are scheduled relative to how close they are to their wedding date. Jessica says ARAG works backward from that date, sending time-appropriate content up until and even after the wedding date. The first email includes the subject line, “Have you talked through these questions before tying the knot?” and is likely sent shortly after the opt-in. The next email, “12 ways to save money on your wedding,” could come a few weeks later. After the wedding, ARAG sends a present: a free trial of ARAG legal insurance. While it’s probably not the first thing newlyweds are thinking about, the timing could be just right. The lesson? 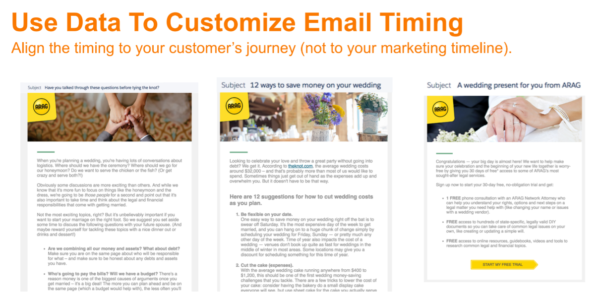 Use what you know about your subscribers to get the timing right and make your emails more relevant. 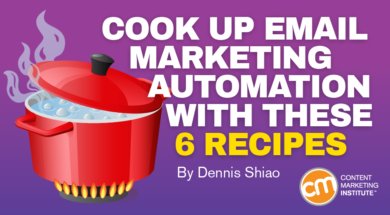 Are you ready for email marketing automation? Given the single-digit statistics for users of email marketing automation, you’re likely seeing your email program’s ROI fall well short of the 3,800% reported by Litmus. Look at these use cases and consider which ones you can apply the next quarter or year. Start simple. What would it take for you to set up welcome or feedback emails in the beginner series? The intermediate and advanced use cases can come later. The key is to get started. What do you think? Will you be opting in? Make plans today to expand your content tech skills in 2019. Register today for ContentTECH April 8-10 in San Diego. Use code BLOG100 to save $100.